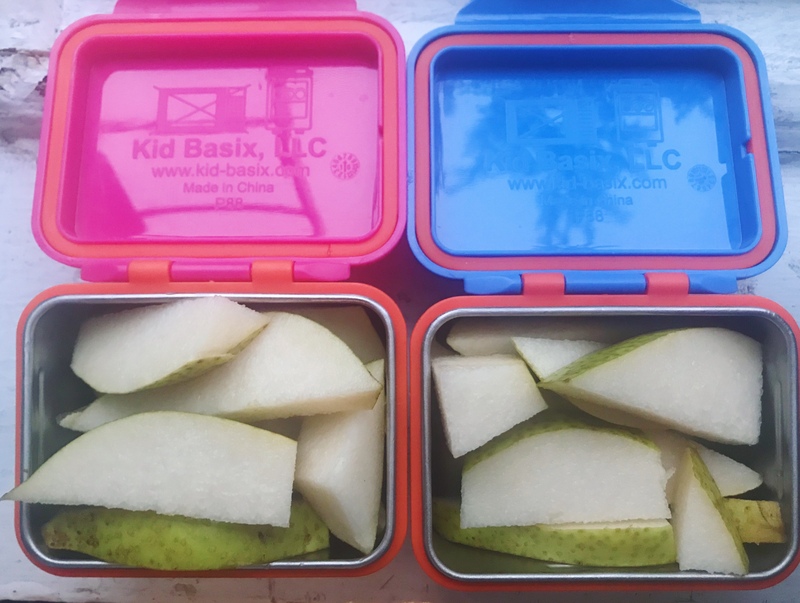 I was excited when Kid Basix sent one of each size, small, medium and large, of their safe snackers for review (one of the three was contributed for our last giveaway-thank you!). 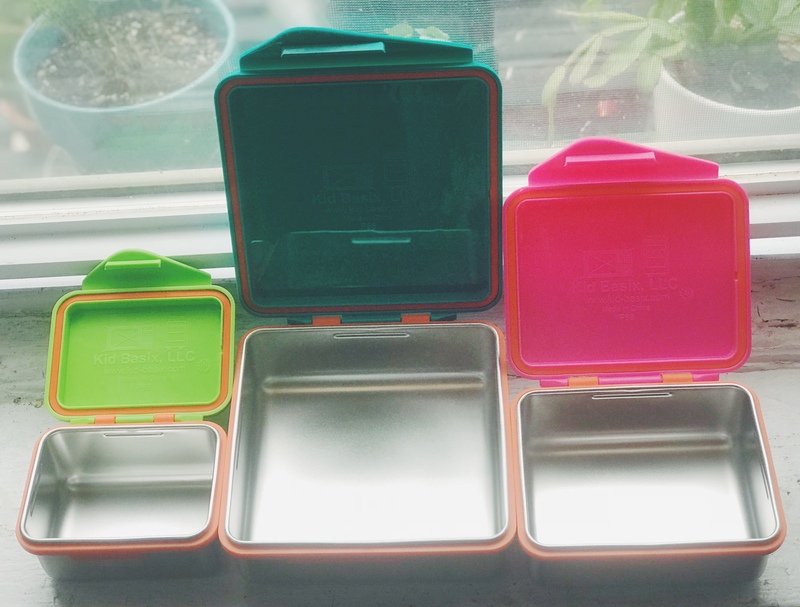 As many of you may already know, I’ve been trying to find little ways to become greener and trying to reduce the use of one time plastic in our home. 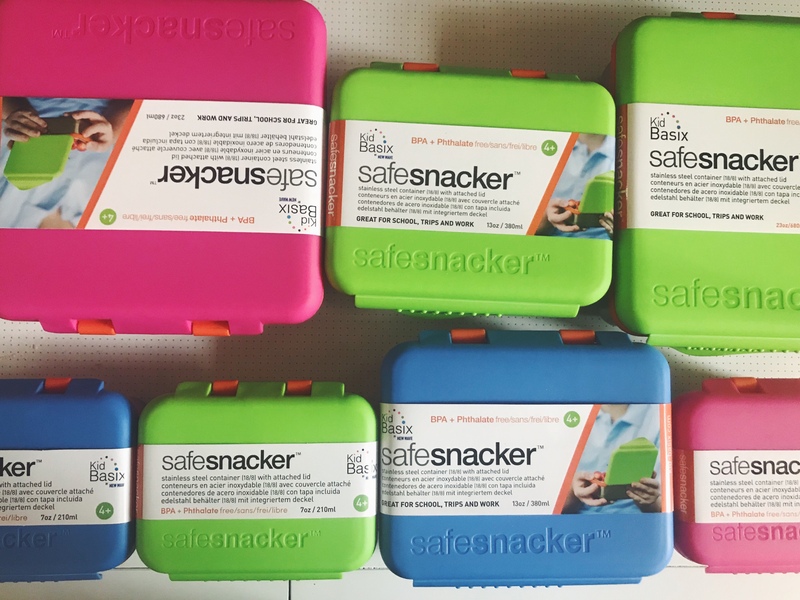 Although these safe snackers do not resemble a ziplock, when compared to the ziplock alternatives that I already reviewed (such as the biodegradable Biobags or versatile Kiva World Silicone Bags), I would like to add these safe snackers onto the list for ziplock alternatives anyway because of its ease of use and how amazingly lightweight they are. The snapping on and off of the lid, my 2.5 year old can do herself. 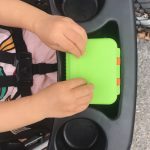 They are so much fun, the kids all want to open them on their own, “Snap on, snap off; snap on, snap off.” The lid can be easily removed to clean. 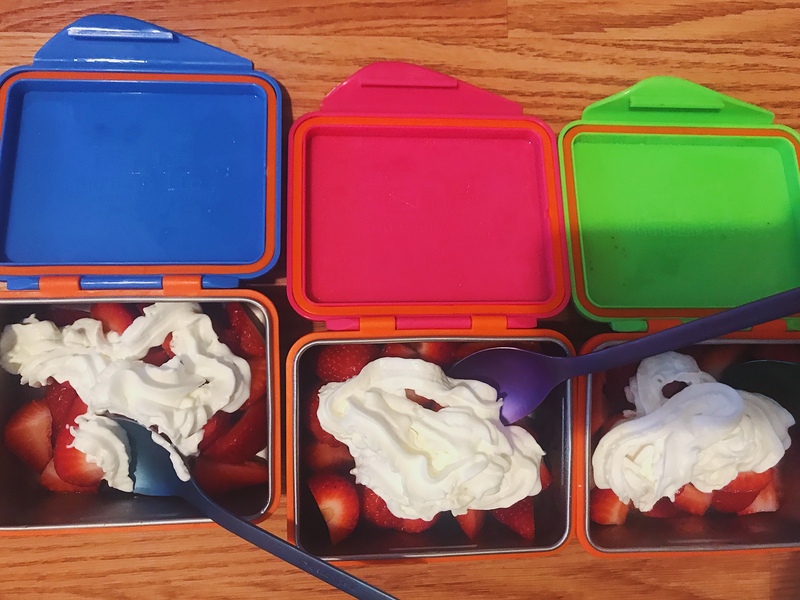 They can be stackable by set or you can store them like you would the typical pints, quarts or other containers you have at home by separating the lid and container. So many ways to store these! 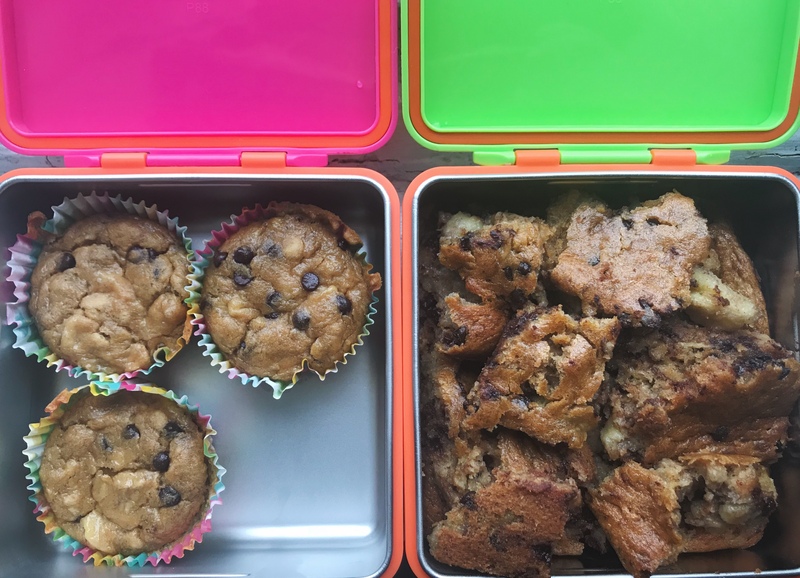 These safe snackers don’t just sit in the shelf waiting for school days and lunch packing. We use them daily and several times a day. They have been used for everything and we use these equally at home and for school. We have since purchased one set of each size in matching colors for each child. We now proudly own a total of 9! 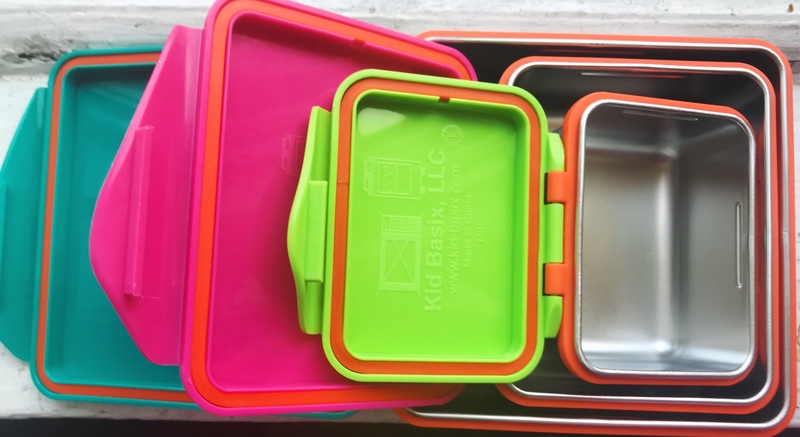 I am really hoping for Kid Basix to create larger sizes for storing away baked goods such as leftover lasagna, muffins or cookies to tote around for parties. I love these for everyday use; and would be really impressed if they came up with an insulated version for soups! 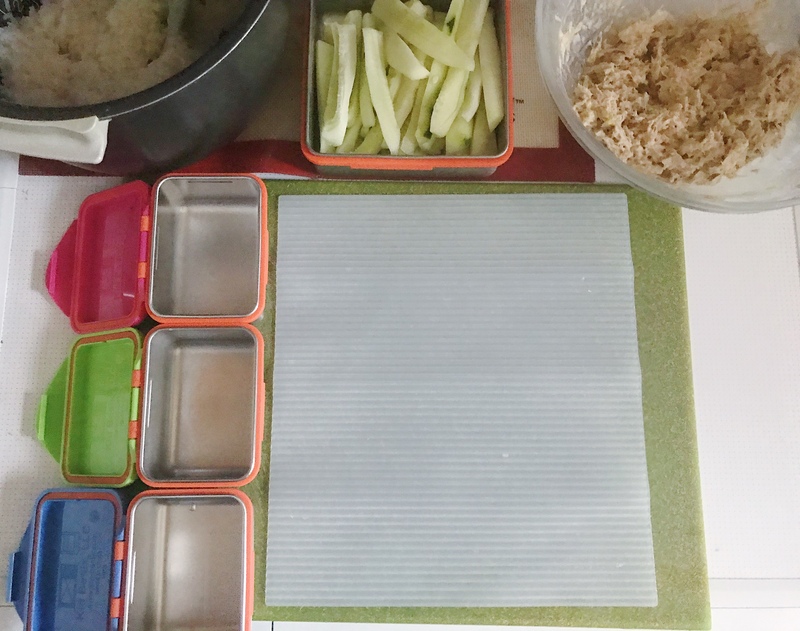 I’ve been making sushi every week since I purchased a silicone mat that makes it so easy to use and clean. No plastic wrap required. 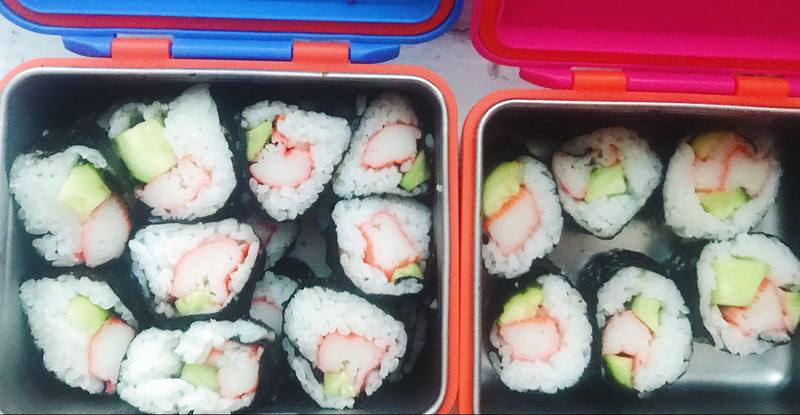 I am in no way a sushi expert, but I watched one sushi making video and I was able to get the gist of how to make it. 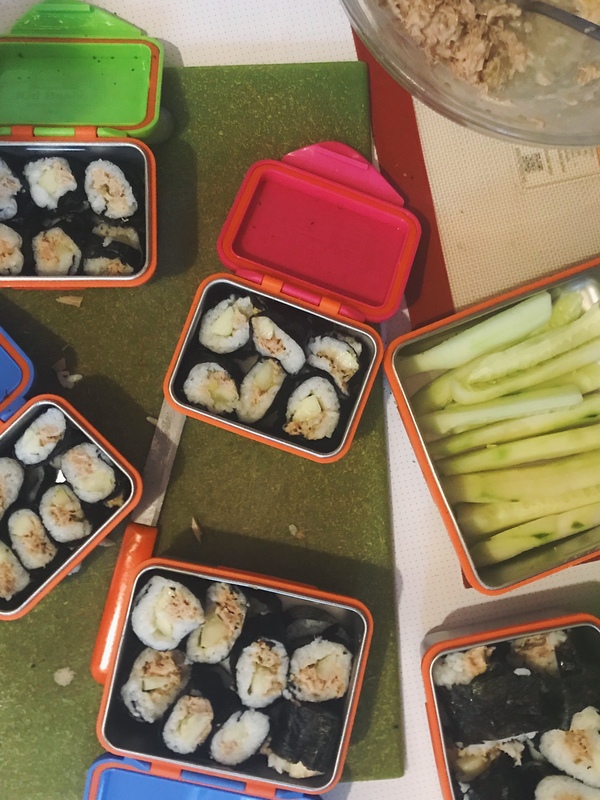 Everyone in my family of five love to eat sushi. We think its fun to make, easy to pack away for a quick snack, its tasty and has carbs, protein and veggies. You can be creative and fill it with anything you want! Olivia gets her lunch packed (due to her ezcema acting up lately) and Ayla gets a few pieces for snack. It’s like an experience in all aspects of the senses. The various textures you get when you pop one into your mouth, the way the flavors meld in your mouth as you chew it and the crunch of the cucumber or daikon. 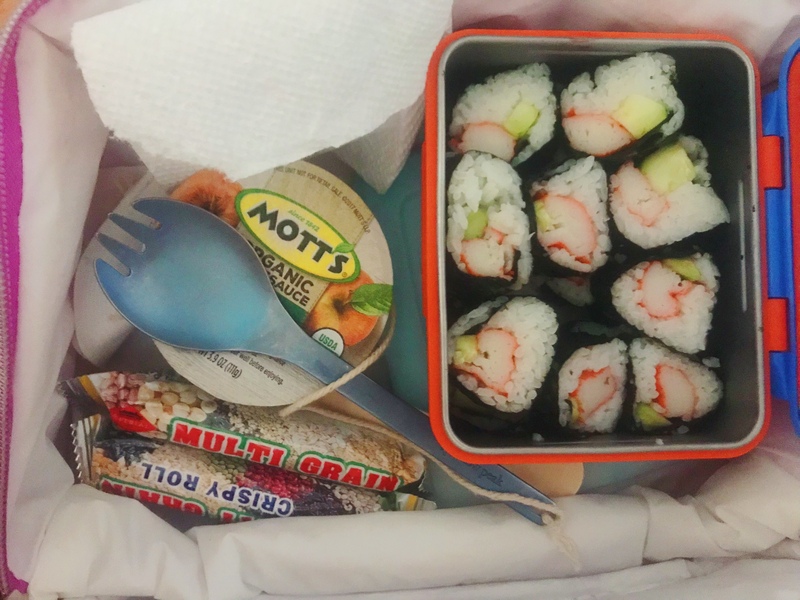 This is a sample (pictured on left) of how I pack their lunch box: Apple Sauce, Chinese Grain Roll and I use twine to tie on her spork. 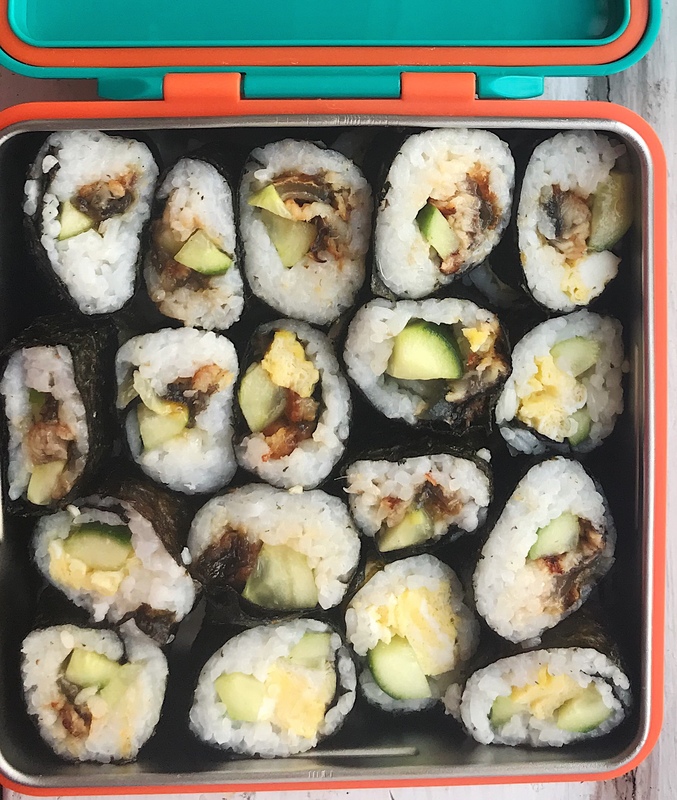 I also like to pack away pre cut cucumber for these rolls in the containers; and sometimes I get leftover from the tuna filling that I pack in another. 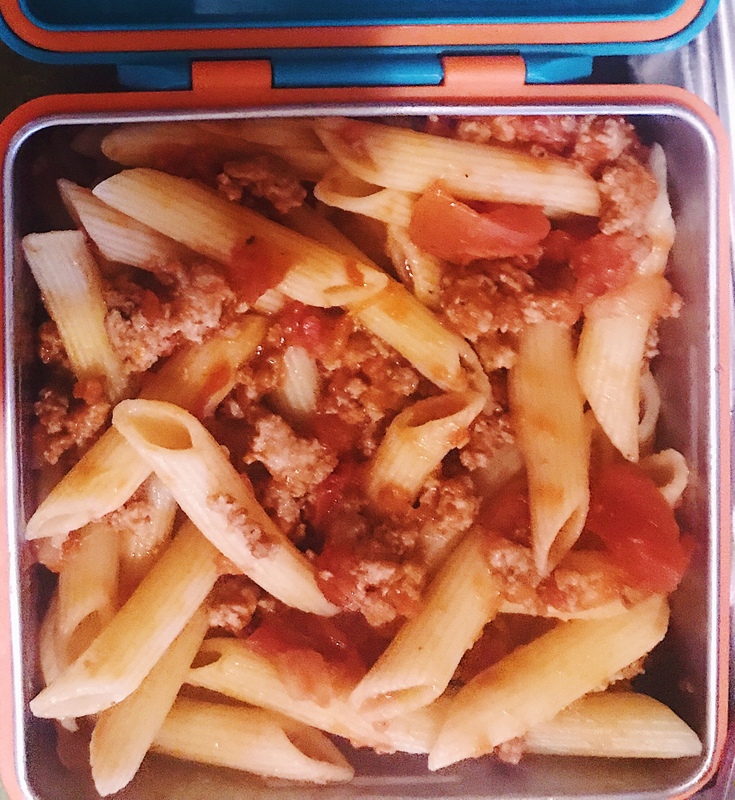 This all makes for an extremely easy assembly on busy days and great for meal prep! 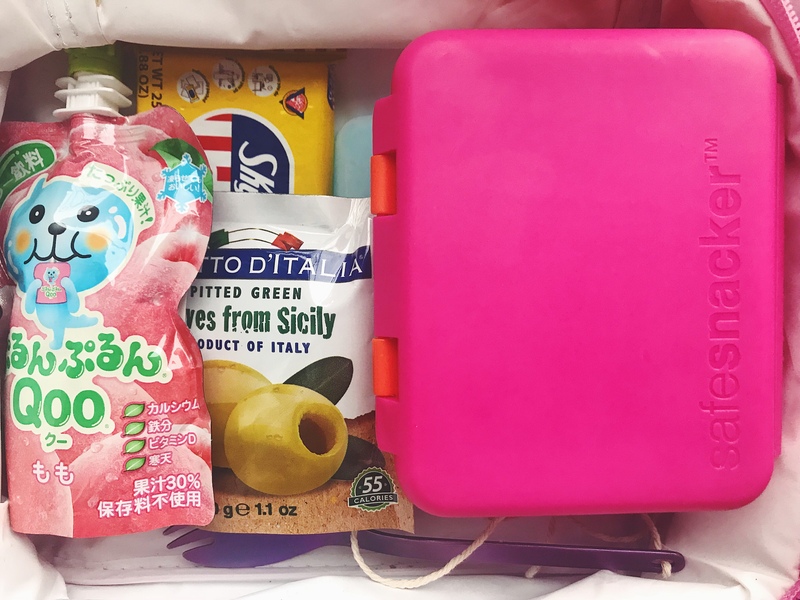 Below I highlight some ways that I pack fruit and cookies in them. I love that nothing gets smushed or cracked because the smallest one holds more than it looks and just the right portion of a snack. 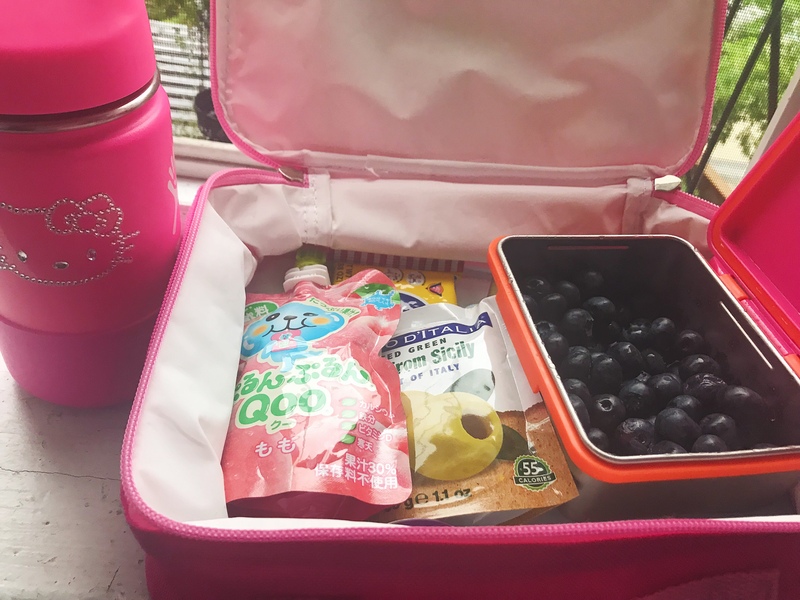 I usually pack a snack for Esme when we head to the park after dropping her two sisters off. One day after school, I had pre-prepped cut up strawberries from earlier that morning. I topped them with whip cream, after they got home for a special treat after a long day at school. Whipped cream is my favorite way of eating strawberries! 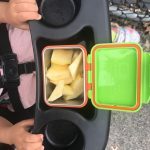 It was snack I was able to happily indulge in when I had to watch my sugar intake (when I had gestational diabetes during my pregnancy with Ayla and Esme). It’s one of my guilty pleasures and every time I have it, it feels like I’m having strawberry shortcake (minus all the sugar from the cake) and satisfies my sweet tooth every time! I took some photos of the sample meals and leftovers I had at home for you to see. Sometimes having a visual helps to see how much a container can hold. 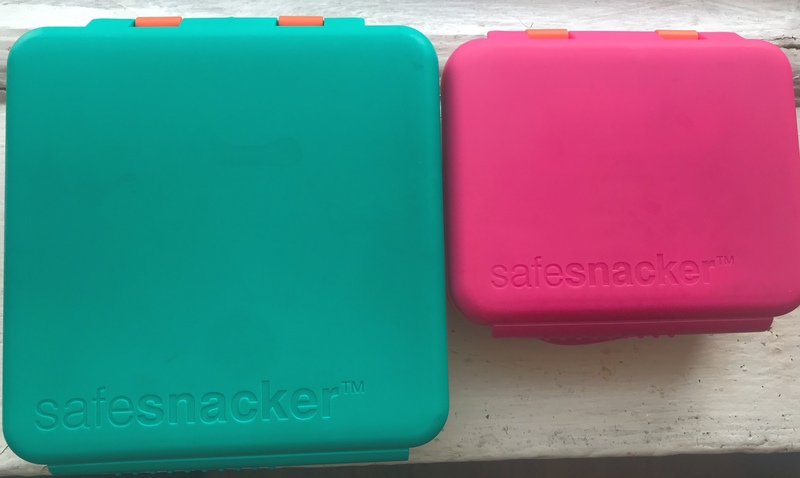 I like that I can fit both a room temperature lunch in the large snacker and fit in a small snacker into their lunch box too. I fill it with cookies, fruit, pretzels and other snacks. There are so many ways to store food items in here. 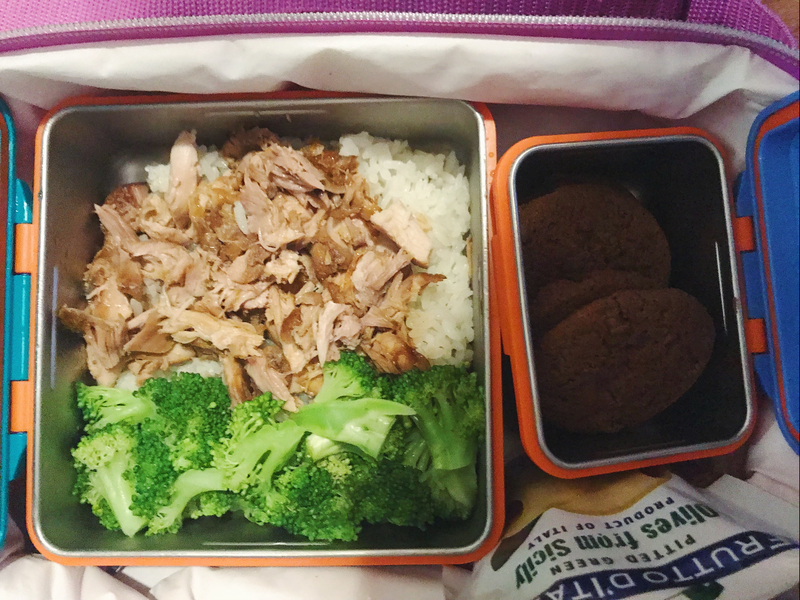 Soy sauce chicken with broccoli for lunch and Enjoy Life Dairy free Double Chocolate Cookies for Snack and Olives. 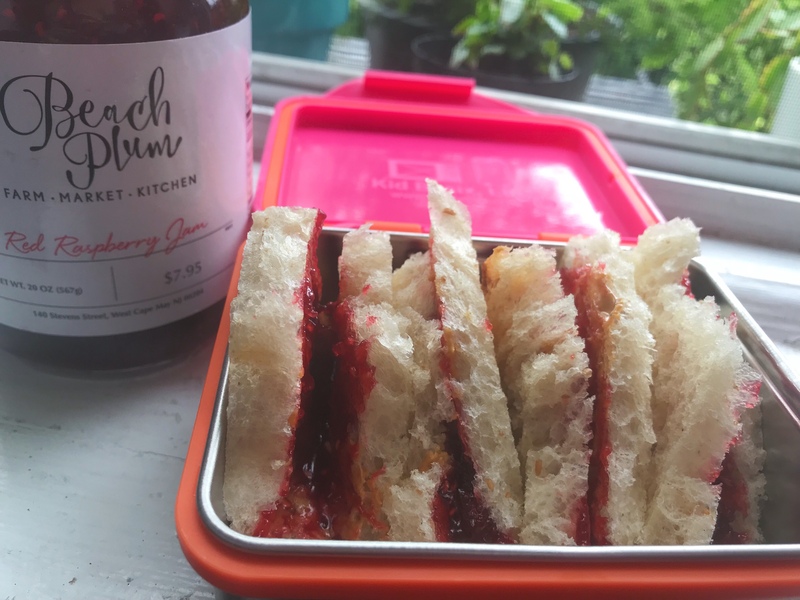 Simple snack or lunch of Jam and sunflower butter. 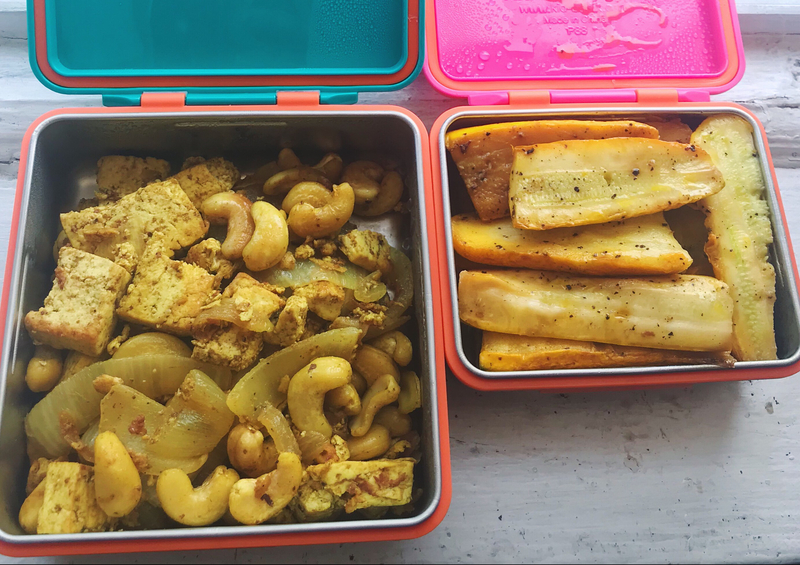 Curry Tofu and Cashew Stir Fry with pan fried squash. 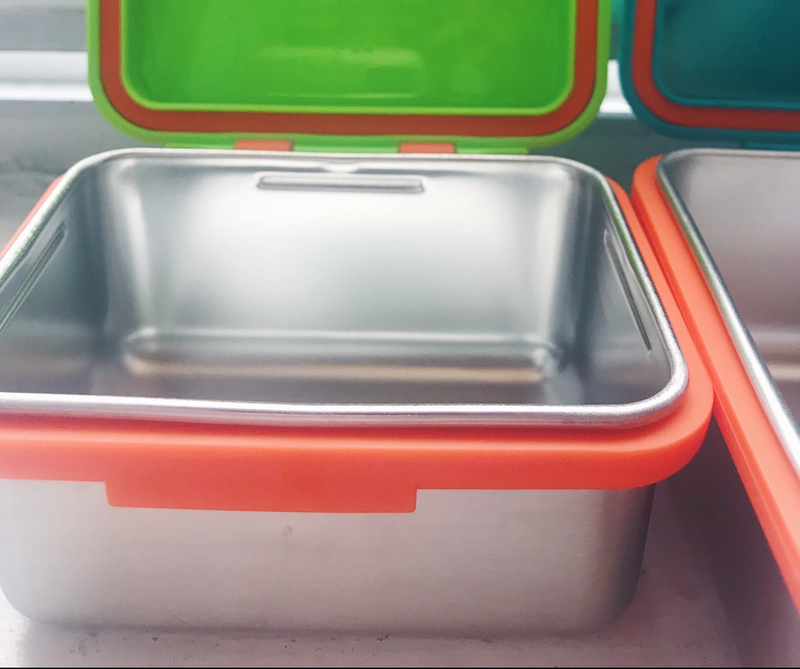 Not sure if you can tell by now what a H U G E fan we are of these Kid Basix Stainless Steel Safe Snackers! They are currently offering a promotion for my followers to get 10% off your purchase when you enter discount code: HOPSCOTCHMOM10. The promotional code is in effect from today, for two months and ends December 1st, 2018. So go, go, go! Head over to their page and load up! Seriously, load up! These little snackers aren’t as pricey as many of the competitors and the attached (and removable) lid is a genius! They won’t drop it under the lunchroom table or throw it in the trash by accident. They are fun to open and the children love seeing the treats and yummy things packed in them. The colors are bright and attractive for kids and adults alike. 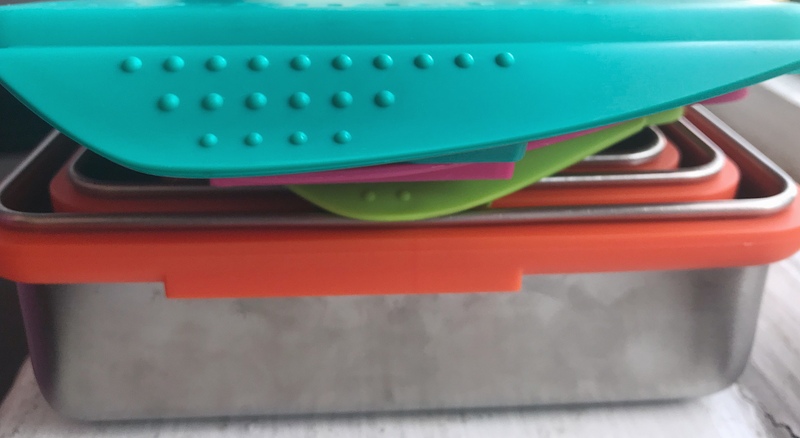 They are also easy to label with masking tape so the teacher can see whether they items yo packed are for lunch or snack and they are super easy to clean. If they had sets in every color of the rainbow, I would be purchasing all of them to complete my collection!